Winco BCS-8 Stainless Steel Bell Creamer 8 oz. 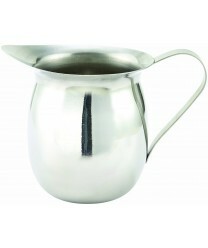 Your coffee-and-tea presentation will shine with the Winco BCS-8 Stainless Steel Bell Creamer 8 oz. This sturdy creamer features an eye-catching mirror finish, an easy-grip handle, and a molded spout that sends cream or milk directly into the customer's cup without splashing or spilling. This tabletop creamer is a must-have for dining establishments that provide hot beverage service, including restaurants, bagel or doughnut shops, convenience stores, and catering halls.